Launched in July 2011, this service lets you watch Sky TV channels on your computer, tablet device or smartphone. It’s a replacement for the old Sky Mobile and Sky Player service. How do I get Sky Go? 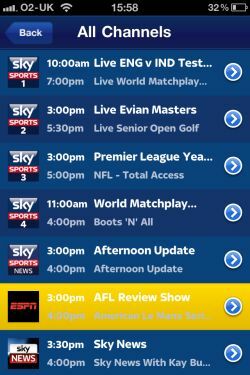 The good news – if you’re a Sky TV customer already – nothing, Sky Go is free to Sky subscribers. Sky Go is also available to non-subscribers, with prices from £15 a month. On the PC version of Sky Go, as well as being able to watch live TV, you can also download content from the Sky Anytime service (which you can also do from a Sky+HD box connected to a Sky Broadband account). We found the TV content on offer to be a little thin. In the Comedy section, we only found 4 shows (My Family, Angry Boys, Modern Family and Raising Hope), with just two shows in sci-fi (Stargate Universe and Ten Wolf). Movies was a bit better populated, with a fairly decent selection of movies that have recently appeared on the many Sky Movies channels. To watch the on-demand stuff, you can either stream the content from your web browser, or if you download the separate Sky Go application, you can select an on-demand show from the library, and the programme will be downloaded onto your hard drive, so that you can watch it offline. 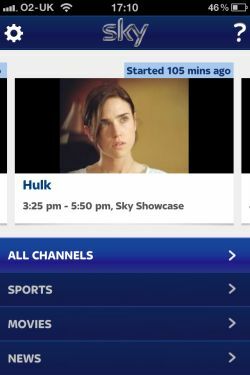 The Sky Go service is free to Sky subscribers, but you can watch what you subscribe to, so you’ll only get the Sky Go Sky Movies channels if you subscribe to Sky Movies on the TV service. Also, note that you can only have two devices “authorised” to use Sky Go – perhaps a desktop computer and an iPhone. You’re not allowed a third device, although you can delete one of your two devices, to make room for a different device. 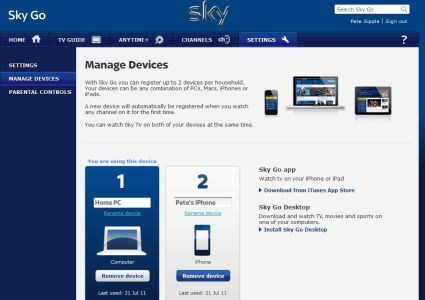 You can manage your devices on the Sky Go website, where you’ll be required to enter your Sky iD username and password. How much bandwidth do I need to watch Sky Go? Got a question we can help with? Please ask! How do I get more channels including radio channels that are within my package. I can only seem to get some of the t.v channels and none of the plus one channels or any of the radio/music channels.